This week has felt like a full week, and it's only been a couple of days! On Sunday, I went salsa dancing downtown at a club called Container. I had a great time and saw many familiar faces there. Last night I had a fun and largely successful climb at Klättercentret. I rode my bike there through the snow, even though I do not yet have studded tires on my bike. I took it a bit slow and was careful not to brake or turn too suddenly. That seems to have worked because I didn't fall either going there or coming back. _MAL3920, originally uploaded by Michael A. Lowry. The sun was out for a good portion of the day today, and it was absolutely beautiful outside. I let Alex outside for an hour, and he actually enjoyed walking around in the snow. 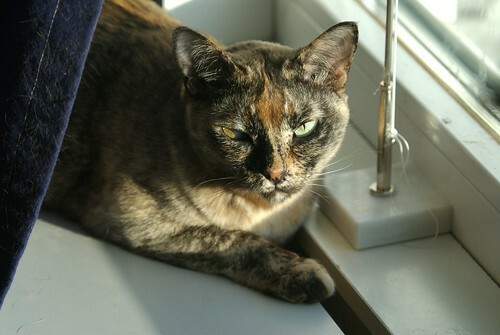 Sasha declined to follow her brother, and opted instead to lie on the windowsill, soaking up the morning sunshine. This evening at sunset, I took a walk down to the lake to take some more nature photos. I didn't manage to get many good ones though, in part becaus the clouds moved in from the North just as the sun was setting. I did take one decent shot of the moon, and a few other shots that I took more for practice than anything else. It was cold out, but this time I was well prepared, wrapped in layers of Polartec & Gore-Tex. My fingers were the only parts of my body that got cold. The big ski gloves I was wearing arn't terribly good at keeping out the cold. They're also too bulky to allow easy operation of the camera through the gloves. I think it's time to invest in some thinner, warmer gloves. Next weekend I'm going skiing, so I guess the timing is right. Just after sunset, the snow began to fall. It began as a light snowfall of tiny flakes; but the gentle fall of snow became gradually heavier as I carefully trudged down the hill toward the lakeside. Once on the path by the lake, I walked under the shelter of the pine trees, along the shore and back to the warmth of my apartment. Tonight I'll go to Chicago, a dance club on Hornsgatan, for a Lindy hop social. I have been to several salsa dance socials, but I haven't been to one of the Lindy hop socials; so I'm eager to see what it's like. There will be live big band music, so it can't be all bad!